Once again, I talked about the so-called negative space. 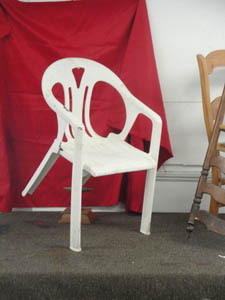 I had set up a still life consisting of a white plastic chair, tilted on a little prop, against a red back ground. 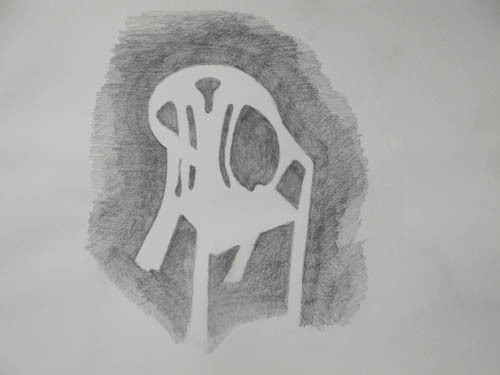 The assignment was to draw the chair (the so-called positive space) by not drawing it at all, but instead by drawing the non-chair spaces that make it possible for us to see the chair (the so-called negative space). This works best when the object depicted is symmetrical, readily identifiable and seen from a weird angle. One student faced the chair from a symmetrical view and that drawing didn’t work. But one new student, Alejandra, was positioned so that her view of the chair was askew. Perfect. 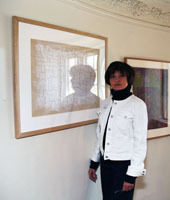 She worked on 18 x 24 paper with pencil. The page is riveting. You just want to look at this apparition. You see the chair by seeing everything that is non-chair. The brain tingles. Such a simple exercise, so easy to conceptualize, and yet so hard to “get.” This is how art works.